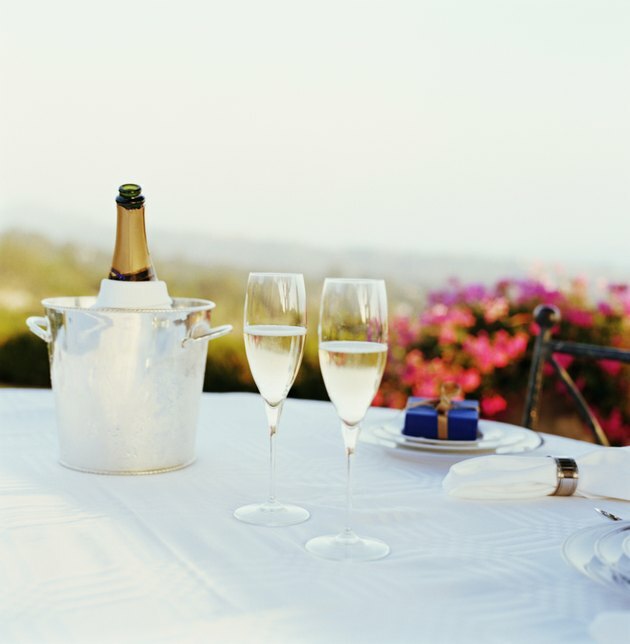 How Many Calories are in Sparkling Wine? Next time you're in the mood for a fizzy beverage to celebrate a special occasion, you may want to consider a wine spritzer instead of sparkling wine. Sparkling wines, such as Champagne, Prosecco, lambrusco and vinho verde, aren't exactly low in calories. The brand you buy, along with whether you choose a red, white or rose sparkling wine, can affect the calories your bubbly drink contains. Champagne and other sparkling wines range in calories from about 84 to 105 per 4-ounce glass, with pink champagne having slightly fewer calories than dry champagne. This is similar to the calorie count of red or white wines, but lower in calories than sweet or dessert wines, which can have 165 calories in a 3.5 ounce glass. For a lower calorie fizzy wine drink, mix regular wine with sparkling water, seltzer or club soda. A mix of 2 ounces of wine and 6 ounces of seltzer has about 40 calories, and a mix of 4 ounces of wine with 4 ounces of club soda has about 80 calories.